Best Buy has the Pikmi Pops Surprise! 2-Pack on sale for just $11.98 (regularly $21.98). 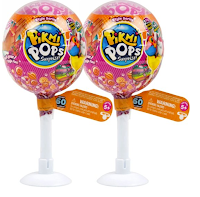 Each adorable lollipop comes filled with delightful mini toys, including two scented mini plushes, two surprise messages and four surprise items. Three dangler strings let you display the Pikmi plushes on a backpack or purse. Use the playful lollipop that comes with every Pikmi Pops surprise pack as a carrying case for all the goodies contained within.